*This review was originally published at Hello Cinema. When Majid Majidi’s Baduk (1992) begins, we meet Jafar (Mehrolah Mazazehi) and Jamal (Maryam Tahan), a young brother and sister waiting for their father to return from the depths of a water well in the dry desert of Southeast Iran. Following their short conversation with a group of elderly men which conveys the recent death of the children’s mother, they watch as the soil begins to fall inward on the well, and their father, trapped beneath heaps of sand, loses his short, helpless battle with nature. Left without parental and financial support, Jafar and Jamal leave their small village in search of a better future. In a matter of hours, they’re lured by a man whose ulterior motive is to sell them for profit. Jafar is sold into slavery and trained to become a drug smuggler at the Iran-Pakistan border. Jamal is sold into an underage prostitution ring operated by Saudis in Pakistan. Jafar begins to learn the tricks of the trade, but all he has on his mind is finding his way across the border to rescue his sister. 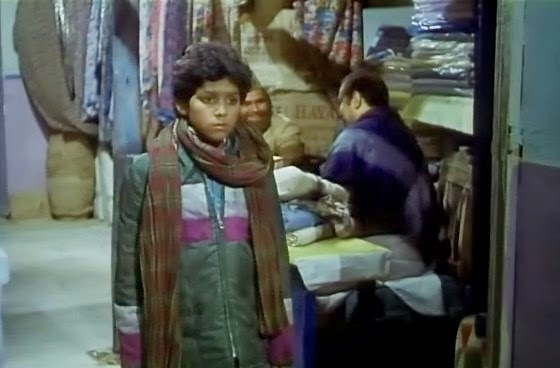 The opening of Majid Majidi’s debut feature is perhaps the most definitive scene in his career, from a director who would go on to nab Iran’s first ever Oscar nomination with Children of Heaven (Bache-haye Asemaan, 1997). The scene serves as a reference point to which many of the director’s favorite motifs can be connected. In Majidi’s next feature, The Father (Pedar, 1996), the plot is again initiated by the premature death of the protagonist’s father. The intimate relationship between siblings is the thematic fulcrum in Children of Heaven. Humanist explorations of poverty continued to be Majidi’s focus in his work, as did multiethnic tensions and examinations of life in rural Iran. On the surface and the basis of their plots, Children of Heaven is the film with the closest parallels to Baduk. One could even argue that the former tells an innocent, milder version of the same story, in which the stakes have been significantly lowered. Both narratives follow a young boy and the lengths to which he must go to save his sister. Jafar is thrown into the adult world and must sneak across national borders to liberate Jamal from her captors. The burden on Ali’s shoulders in Children of Heaven doesn’t weigh quite as much—he is given the financial responsibility to find Zahra a new pair of shoes—but the thematic foundation is the same. Both films tell stories of young boys who have to punch above their weight in order to provide for their family, yet Baduk is the bolder, more politically daring film. Baduk navigates, literally and figuratively, the dangerous waters of child slavery, prostitution and the tumultuous politics of Iran’s most underrepresented province in cinema, Sistan and Baluchestan, with poise and subtlety. Very few Iranian films have tackled these issues since. Was it the trouble Majidi faced with censors over Baduk that pushed him into more conservative territory in his later works? Is that why the brutal murder of a young child so openly depicted in this film gave way to the portrayal of death in Color of Paradise, in which “the boy’s soul departed like a fading light” so gracefully? * This is no slight on Majidi’s later films; his oeuvre exhibits remarkable consistency in quality. Plus, provocation alone does not make for a good film and its absence not for a bad one. However, it is intriguing in retrospect that the flag-bearer of humanist cinema in Iran started his directorial career by holding a knife to his audience’s throats. Would Majidi’s career have turned out differently if his first film was celebrated, rather than slashed, by authorities for its critical but compassionate look at Iran’s neglected southeast? There is no romanticization in Baduk. Majidi plunges so deep into the Baluch milieu, with its long history of social troubles, that the realities of Jafar’s severe circumstances speak volumes without any need for melodrama. The young man’s acts of valor are not consequences of a need for dramatic beats; they are rugged, thorny truths from a part of the country that has barely been recognized for its destitution. The depiction of a child sold into slavery and taught to smuggle drugs from one country to another, climbing across barbed wire in search of his sister is Majidi’s indictment of a reality close to home yet almost seemingly foreign in a national cinema centered in Tehran and populated by films about the city and its residents. Though Majidi’s later works took him on a journey to other distant reaches of rural Iran, none expressed as much ideological audacity as Baduk. * Hamid Naficy, A Social History of Iranian Cinema, Vol. 4: The Globalizing Era, 1984-2010, pg. 221.